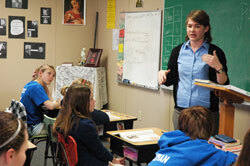 RIPLEY COUNTY—Through prayerful discernment, Jennifer Prickel discerned that God was calling her to religious life. She was even accepted by the Steubenville, Ohio-based Sisters of Reparation to the Most Sacred Heart of Jesus. Ordinarily, this would be a cause for rejoicing for this 23-year-old member of St. Anthony of Padua Parish in Morris and her family. She has such a large amount of debt because she attended Franciscan University of Steubenville in Steubenville, Ohio, for three years, which, like most private colleges and universities, has high tuition and room and board costs. “I loved it, but it’s pretty expensive,” Prickel said. Such a looming obstacle to a religious vocation might depress some aspirants to religious life, but not Prickel. Last fall, she came home to teach language arts and religion at St. Nicholas School in Ripley County, where she was a student years ago, a place that she says nurtured the seeds of her vocation. Prickel was also awarded a grant from the Mater Ecclesiae Fund for Vocations to help pay off, over time, part of her debt. The fund is a public charity based in northern Virginia. And the Sisters of Reparation might pay off part of her student loans if only a relatively small portion is left after the income she has earned in teaching and the grant from the fund cover the rest. Prickel had hopes of entering the religious community this fall. But the amount of her debt is still too large for that to happen. Judy Luhring, St. Nicholas’ principal, taught Prickel when she was in the third grade at the Batesville Deanery school, and is proud to have her former student back as a teacher. Although she is happy about how Prickel is leading the students and other teachers at St. Nicholas closer to God, Luhring has personal reasons for giving thanks for her presence there. Mother M. Wendy McMenamy, the superior of the Sisters of Reparation, is also impressed by Prickel. If Prickel’s future religious superior and her former teacher and current principal are this proud of her, just think how her parents, Steve and Amy Prickel, also members of St. Anthony Parish, feel.